Sunyani (B/A) May 4, GNA - A total of 175 units of blood was donated by patrons of a special blood donation exercise organised by the management of the regional hospital in Sunyani as part of last Saturday's May Day celebration. The programme, the first of its kind in the region was held in collaboration with the local SKY FM radio station to help arrest the critical blood shortage at the hospital. More than 500 voluntary donors, comprising workers in both the formal and informal sectors, as well as students took part in the exercise. The programme was started on a rather dismal tone, as only a few donors had gathered as at about 0700 hours at the forecourt of Cocoa House, venue for the exercise. But the situation changed later, following appeals by the FM station. 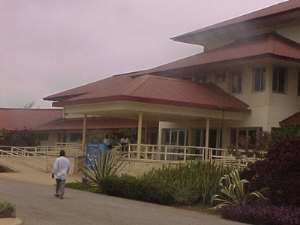 Ms. Rita Ackwah, the hospital's administrator, in an interview with newsmen commended the donors, who included several females, for their concern for the plight of the sick. She said relatives were initially called in to donate blood to save the lives of their sick folks, since the blood bank could not help, as the response was not encouraging. The technical planning committee of the programme therefore saw the May Day celebration as the ideal period for the exercise.